Autonomy Summit 2017: are we really on the cusp of urban mobility change? This week our team travelled to the idyllic French capital to attend Autonomy – an annual international event on the future of urban mobility. A platform for industry professionals and innovative thought-leaders to meet and exchange ideas and opinions regarding the way we currently move in and around our cities and solutions to potential future issues. Unsurprisingly, top of the agenda were topics surrounding autonomous and electric vehicles and shared and active mobility. A particular point of interest came from a discussion surrounding a shift towards electric vehicles from Oslo’s Agency for Urban Environment. It was stated that if we are going to lower emissions globally, then we have to start with traffic. Now, whilst we agree with this sentiment, solutions were automatically found to be EVs, active mobility (walking, bicycles, etc) and autonomous vehicles. In an ideal world this would be a viable resolution, however something most people in the industry agree with, is no one is quite sure when these transportation modes will be available for the masses and what public take-up will be. For the moment, people still find value in owning their own vehicle and using that vehicle to travel to and from cities, and so when looking at solutions we need to be realistic about what is feasible currently – which is where reserved parking can play an important role. With drivers spending so much wasted time searching for city centre parking, adding to the output of harmful emissions, pre-booking a parking space close to a desired location is one of the best options currently for both the driver and the environment. The exhibition itself focused primarily on next gen active mobility and included every incarnation of a bicycle you could imagine! 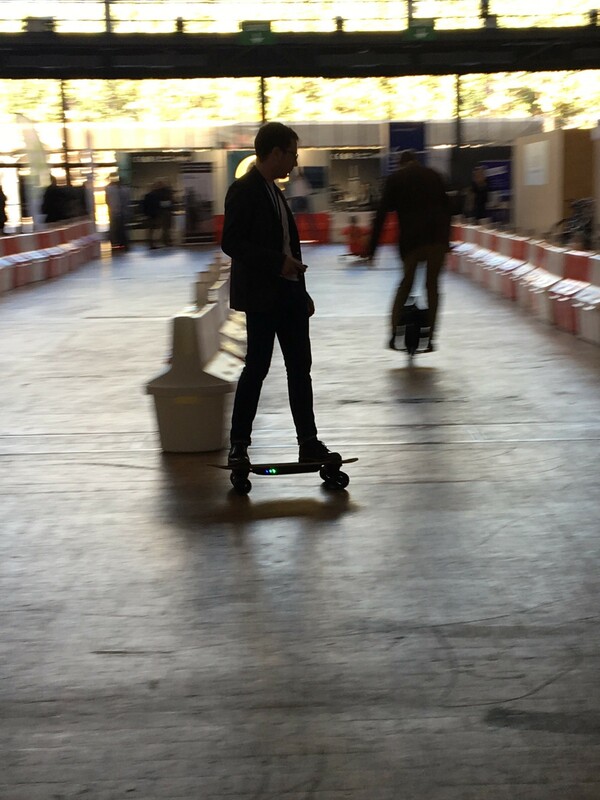 We also got to preview autonomous postal delivery pods, hands-free segways and Quentin even had a test-run on an electric skate! Generally, the summit presented a great platform for ideas, discussion and innovation, however putting the wheels into motion (literally) is going to be a different story altogether. Dedicated collaboration is needed from a host of different organisations and a proper legislative framework needs to be discussed in order for predicted changes to become reality. Nevertheless, it was inspiring to see industry and technology combine, not only to tackle environmental issues, but showcase how it’s possible to adapt to a new way of thinking when it comes to how we move around our cities.